The purpose of music is to touch hearts. Victoria is an undergraduate student at George Mason University pursuing violin performance and pedagogy studying under June Huang. She is currently part of a quartet group called the Alpine Five that performs at special events, etc. She is also a member of the George Mason Symphony Orchestra and chamber ensembles. Victoria has 13+ years of playing and performing experience beginning at the age of 8 along with 8+ years of orchestra experience. 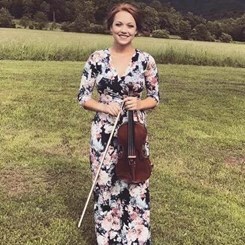 She has attended University of Georgia and Belmont University orchestra camps multiple years and performed in the chamber ensembles and orchestras. Victoria was Co-Concertmaster of the Reinhardt University Symphony Orchestra and principal second of the Spivey Hall Honors Orchestra. She has performed at Spivey Hall, The Rialto Center for the Arts in Atlanta, Georgia and many others. In the near future, Victoria will be working towards receiving her Suzuki certification. Victoria is dedicated and passionate about music, violin, and teaching. Music has always been a part of her life and she wishes to spread the joy that it has brought her to others. Whether you are a beginner or an advanced violinist, Victoria hopes to share her experience, knowledge, and passion of music/violin with you! Request Lessons with Victoria Behrens today!